Introducing the Rainmaker-Focused Website: A next-generation approach to law firm websites. We normally don’t use our blog to promote our own work. However, we’re making an exception today since it’s an important milestone for Great Jakes. After years of building traditional websites for law firms, we have just introduced an entirely new approach. We call it the Rainmaker-Focused Website and it employs a next-generation web-marketing paradigm that we developed for law firms. It required more than a year to refine our ideas and build the supporting technology. 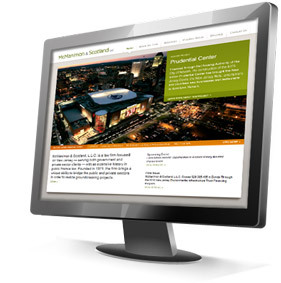 The first implementation of the Rainmaker-Focused Website was created for McManimon & Scotland, a law firm in New Jersey that is renowned for its public sector work. For those of you who follow our blog, you’ll see that Rainmaker-Focused Website reflects many of the ideas that we’ve been writing about for months (like this one, this one and this one, just to name a few). The defining element of the Rainmaker-Focused Website are attorney microsites. Attorney microsites are multi-page attorney bios sections — essentially, small, highly-customizable websites for each attorney that fit seamlessly within the firm’s larger website. Our microsite approach is a significant departure from the single-page, “cookie-cutter” attorney bios found on most law firm websites. The Rainmaker-Focused Website is supported by a highly robust, yet easy-to-use, content management system (CMS) that was built using an open-source CMS framework. It works like a dream. If you’re interested, I would be happy to show you our new backend. To learn more about the Rainmaker-Focused Website, click here, or call me at 212-699-3684. I would be happy to give you a guided tour. 9 comments... read them below or add one. 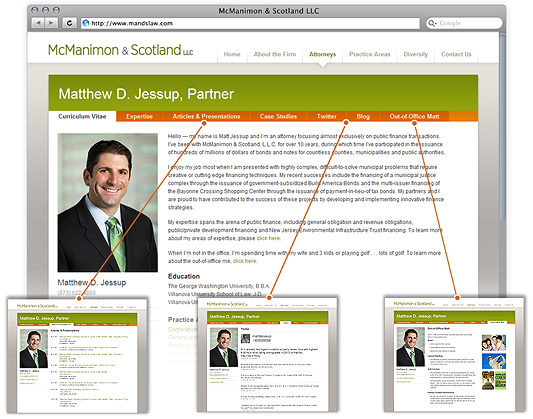 The McManimon & Scotland website is grand. Really great functionality, with a fresh, friendly look. I really like the attorney microsites. The challenge, of course, is to get some lawyers to create content, but that’s another story. Thank you for the compliments! So glad that you like it. Robert, I LOVE THIS!!! Congratulations to you by staying on top of what is most important in client communication and trends today. I respect you and your work a great deal. I’ve been in the website game almost 10 years and can I just tell you what a breath of fresh air it is to see a law firm site with so much interactivity and functionality? Excellent job, Robert! No question that firms are going to have to make a major commitment to helping their attorneys create and execute on a content strategy, but hopefully they will soon recognize why the investment is a no-brainer, even in tight economic times. Can’t wait to see these sites sprouting all over the web! Nice site. Personally, I hate the phrase Rainmaker, but then i’m English so that might account for that. I assume it’s a wordpress based site so you can add as many media rich modules, widgets etc as deemed necessary by the client? There aren’t many of the lawyers who blog (2 of the first 9 clicked on) but it’s a great function to build into a web template. Good job. Congratulations! This is a great design and looks very easy to navigate. I couldn’t agree more with your comments. Law firms would have much better results if they treat their website as a business development tool. Good luck and I hope it’s a hit. I could also see a version of this used in accounting and even real estate. I would actually like to see more. I may have a client that needs this very thing. Please reach out to me. Do you mind if I quote a couple of your articles as long as I provide credit and sources back to your blog? My website is in the very same niche as yours and my visitors would truly benefit from some of the information you provide here. Please let me know if this ok with you. Many thanks!